Pietro Egizii first came to Painesville, Ohio, between 1920 and 1929. In America, Pietro Egizzi was known as Peter Egizii. Pietro Egizii, son of Luigi Egizii, was born on Thursday, January 1, 1903, at Caramanico, Italy. Pietro was married to Mary Malocko. Pietro Egizii, age 17, first immigrated to the United States on September 17, 1920. He was travelling to Dawson, New Mexico. 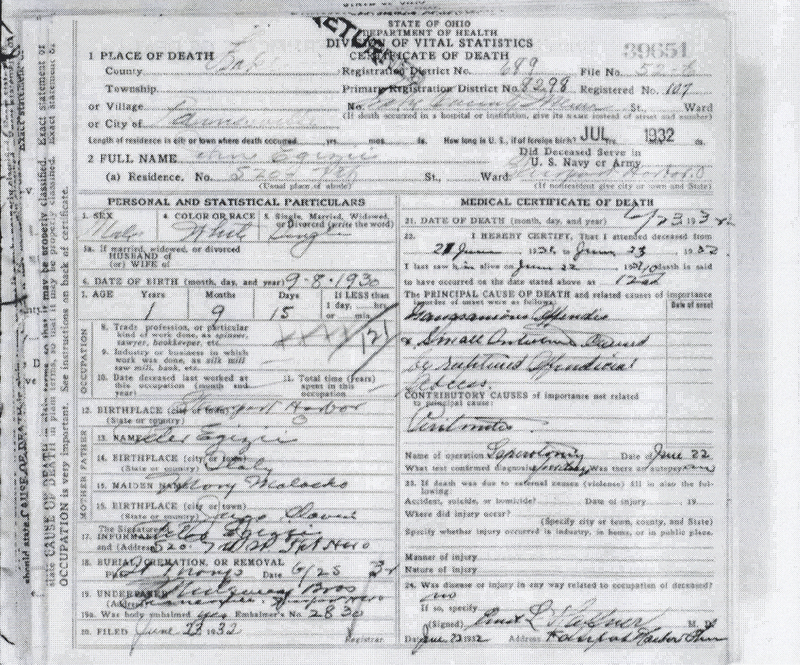 Peter Egizii became a citizen of the United States in 1929. Peter resided at 520 Seventh Street, Painesville, Lake County, Ohio, when he was naturalized. 1. John Egizii was born on Monday, September 8, 1930, at Fairport Harbor, Lake County, Ohio. John died on June 23, 1932, at Lake County Memorial Hospital, Painesville, Lake County, Ohio, at age 20 months, of a ruptured appendix. His body was interred at Saint Mary Cemetery at Painesville Township, Lake County, Ohio.